A little while ago, I had the privilege of going to the head office of DK Books in London to take part in a focus group on social media and crafts. Blogging, social media, books and crafts ~ these are a few of my favourite things! And I got to sit and talk about them with other people who love them just as much! It was only scheduled to last an hour but we could have talked for aaaages! (I realise I'm using a lot of !!!! ~ this is what is known as lazy writing ~ slap wrist for me!). If it weren't for the fact that Mum was waiting across the road in a coffee shop looking after Ruby, I would have lingered longer! And you know what I realised? I know stuff! I know things that other people don't know. Us bloggers are a wealth of knowledge, on topics that other people don't know about. It's not geekery, it's expertise! Isn't that funny? You go through life, just pottering away with your quirky little interests that no one else seems to understand. And then you get asked about them. And you end up sounding quite, well, knowledgeable! Me? Knowledgeable? About crafts? And social media? And blogging? If you had asked me back when I graduated university with a journalism degree if this was the direction I saw my life taking, I would have looked at you in bewilderment! But now that I am here, I love it. I love that I am a crafts journalist. I used to think it was such a pain, that it was too niche, that I could never create a career out of crafts. But I now think I can. Because I know things that other people don't know! What a lovely hour it was! Chatting with the likes of Miriam, Joanne, Holly and the DK Team. 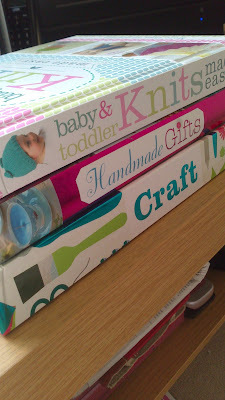 Of course, they didn't allow us to go home empty handed, and we left laden with some beautiful new craft books to have a look at. I'll be posting about them soon ~ watch this space! In the mean time, check out DK's Pinterest account ~ they have some lovely ideas on gifts, home decor and baking.